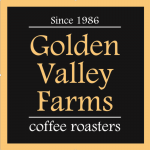 Golden Valley Farms Coffee Roasters is a family owned and operated artisan coffee roaster located in West Chester, PA. With over 30 years of experience in coffee sales, national distribution, and branding, our roots in the coffee industry run deep. We roast a large selection of Organic, Shade-Grown, Bird-Friendly, and Fair Trade coffees. We are one of the few Triple Certified Coffee Roasters in The United States. Email your order to orders@goldenvalleyfarms.com, and pick up next week, 7/25, from Mojo’s Popcorn.